One of the greatest challenges of any genetic analysis project is the seemingly endless formatting, manipulation, and editing of data that takes place in order to properly perform analysis. This challenge is significantly compounded when the project involves whole genome data with millions to billions of data points. 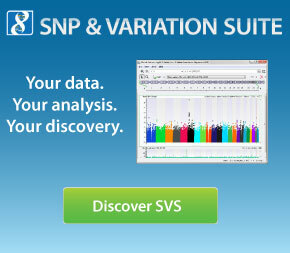 SNP & Variation Suite 8 (SVS 8) eliminates much of this hassle with streamlined data import of virtually any file format, as well as real-time spreadsheet manipulation and editing on a grand scale. This tutorial seeks to guide you through basic importing and spreadsheet manipulation. The steps outlined below aim to make you a power user by providing example of functions that are often under-utilized but can make spreadsheet manipulation a breeze. To complete this tutorial you will need to download and unzip the following file, which includes four files. Affy 6.0 HapMap Example Data.dsf - Affymetrix Genome-Wide Human SNP Array 6.0 genotype example data in Golden Helix DSF Format.